We energize curiosity about aquatic life and the environment to inspire positive action. Captivating exhibits rich with aquatic biodiversity, friendly personalities, familiar faces and a nationally recognized historical foundation help bring this mission to life. 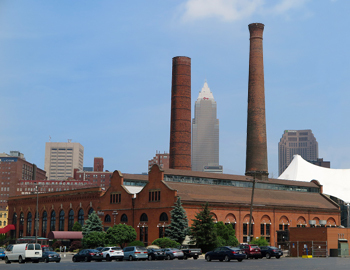 The Greater Cleveland Aquarium is nestled in the historic FirstEnergy Powerhouse on the banks of the Cuyahoga River. The building originally was constructed in 1892 to provide electricity to Cleveland’s streetcars and railways. Architect John N. Richardson designed the brick powerhouse in the Romanesque revival style and the National Historic Landmark is still known for its stylish arched windows. As the automobile’s popularity grew, the need for the powerhouse waned and the building closed its doors in 1920. In the 1990s and 2000s, the structure was revitalized, playing home to comedy clubs, restaurants and even a few retailers. A large portion of its space was again reimagined when New Zealand-based Marinescape NZ Ltd. chose Cleveland as its first North American project. The Greater Cleveland Aquarium opened to the public in 2012 and distressed brick walls, exposed ductwork and reimagined coal chutes and chimneys juxtapose Northeast Ohio industrial history with the Aquarium’s conservation message. Today the Aquarium is owned and operated by Jacobs Entertainment Inc.